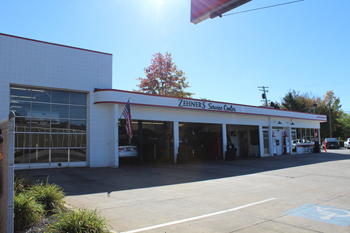 Zehner's Service Center Offers Auto Repair Services You Can Count On! Since 1946, Zehner's Service Center has provided motorists in the Akron, OH 44306 area with comprehensive auto repair services that include Alignment, Brakes, Car & Truck Care, Domestic Cars & Trucks, Electrical Services, Electronic Services, Engine & Transmission, Engine Maintenance, General Services, Heating and Cooling Services, Import Cars & Trucks, Miscellaneous Services, Tires, Towing, Transmission Services and Undercar Services. Our goal is to offer the best services available at affordable prices to get you back on the road in no time. For a high-performing vehicle, trust Zehner's Service Center with your car, truck, or van. To learn more about the services we offer, please contact us by phone at 330-784-1041 or send us an email. We also invite you to learn more about our dedication to you, our valued customer. I called a few days ago to set up an appointment for new tires/ alignment. I was told I could be there at 8:00 am and I would be done by 10:30. To make a long story short, no fault of Zehners, the new tires did not arrive on time and I was informed of that the day before. I was offered a better quality tire for the same price I planned on paying. At 10:30 I was told those tires never showed up. Needing to make a prior appointment at 11:00 am they offered me their company S10 to do my errands. I used that truck for 2.5 hours to get my taxes done, etc. I used to go to another place where I received a considerable discount but you just can't beat the expertise, quality, and honesty. You really can't put a price tag on what it means to have the peace of mind you will be treated fairly and honestly each and every time. They honor their work and back it with a guarantee. No where else I'll ever go to get my vehicle worked on! It didn't go as planned but you made it more than right! Thanks again! I have worked for Goodyear Aerospace, Loral and Lockheed Martin the past 36 years and the one constant during those years has been Zehner's Service Center for all my vehicle repairs. Starting with Ron at the front desk through all the mechanics at the center the atmosphere is friendly and professional. A few of the best qualities are that they listen to you and are honest about the work required. Depending on the situation with each individual vehicle they will advise the customer on work is required as well additional concerns, with no pressure for agreed upon work. Mechanics look at each vehicle for safety of the customer and suggest options for repairs with first priorities and later concerns. Bottom line; I have never had reasons to look anywhere else for servicing my car/truck repairs than at Zehner's Service Center. We got my car back, and she is quiet as can be, I mean cars make their own noises, but she is back to herself. I will never take my cars to any other place they are always so helpful and willing to bend over backwards for their customers. Needing top notch mechanical needs? Look no further! I own 2 vehicles over 10 years old and with that comes continuous mechanical repairs. I personally am a car guy and know my way around a vehicle. I have also been in the collision repair industry for close to 20 years and have worked in less than a hand full of body shops (independently owned and corporate companies) and whenever I need expert advise ... they are the first ones I call! Honesty, integrity, passion is the ONLY thing you get from Ryan, Ernie, Mark and the entire crew /family of Zehners! Could not be more grateful to the crew for REALLY telling me what was wrong with my car, unlike a previous shop. This is the place to go. I've been coming here for 25 yrs !! They're the BEST!! Honest and trust worthy and fixed right the first time!! Honest, fair, reasonable pricing. Zehner's is a quality shop for any make and model. Best customer service you will ever get!!!!!!!!!!!! I dropped my 2009 Toyota Prius off for an oil change and for repair of two front lights (headlight and a parking light). They only charged me $71.79 for both where most dealer's charged $80 just for the lights. I would highly recommend them. Honest people who do not over charge you for auto repairs.